The pterygoid plexus (/ˈtɛrɪɡɔɪd/; from Greek pteryx, "wing" and eidos, "shape") is a venous plexus of considerable size, and is situated between the temporalis muscle and lateral pterygoid muscle, and partly between the two pterygoid muscles. It receives tributaries corresponding with the branches of the maxillary artery. This plexus communicates freely with the anterior facial vein; it also communicates with the cavernous sinus, by branches through the foramen Vesalii, foramen ovale, and foramen lacerum. Due to its communication with the cavernous sinus, infection of the superficial face may spread to the cavernous sinus, causing cavernous sinus thrombosis. Complications may include edema of the eyelids, conjunctivae of the eyes, and subsequent paralysis of cranial nerves which course through the cavernous sinus. 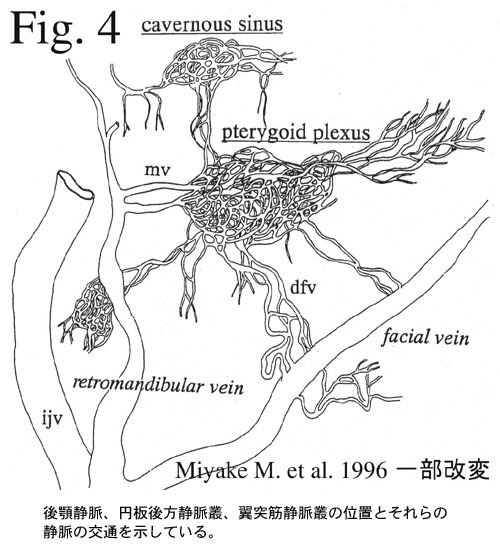 The pterygoid plexus of veins becomes the maxillary vein. The maxillary vein and the superficial temporal vein later join to become the retromandibular vein. The posterior branch of the retromandibular vein and posterior auricular vein then form the external jugular vein, which empties into the subclavian vein. ^ Entry "pterygoid" in Merriam-Webster Online Dictionary. Anatomy photo:27:13-0100 at the SUNY Downstate Medical Center - "Infratemporal Fossa: The Pterygoid Plexus of Veins"